China has been opposing India's Oil and Natural Gas Corporation (ONGC) exploring oil in areas claimed by Vietnam in the South China Sea. PM Modi held wide-ranging talks with Vietnamese President. New Delhi: India and Vietnam today vowed to join hands for an open and thriving Indo-Pacific besides ensuring an efficient and rules-based regional security architecture, seen as a thinly veiled message to China over its increasing military posturing in the region. After wide-ranging talks between Prime Minister Narendra Modi and Vietnamese President Tran Dai Quang, the two strategic partners inked three pacts providing for cooperation in nuclear energy, trade and agriculture. They decided to explore co-development projects in defence sector and boost ties in oil and gas exploration, including trilateral cooperation. PM Modi said both sides expressed commitment to an open, efficient and rules-based regional architecture and to expand bilateral maritime cooperation further. "We will jointly work for an open, independent and prosperous Indo Pacific region where sovereignty and international laws are respected and where differences are resolved through talks," PM Modi said in a media statement in the presence of the Vietnamese President. In an apparent reference to the South China Sea dispute, the Vietnamese president said it supports India's multi-faceted "connectivity" with ASEAN and asserted that there must be freedom of navigation and over flight in the region. He said that disputes must be resolved through peaceful means. Vietnam and several other ASEAN member countries have territorial disputes with China over the resource-rich South China Sea. While India, the US and several other world powers have been pressing for resolution of the dispute on the basis of international law, China has been favouring a bilateral framework with respective countries. PM Modi said India and Vietnam will also look for trilateral partnership in oil and gas sector. China has been opposing India's Oil and Natural Gas Corporation (ONGC) exploring oil in areas claimed by Vietnam in the South China Sea (SCS). India has been asserting that the ONGC's exploration is a commercial operation and not connected with the dispute. Oil exploration in the SCS is a sensitive issue in the Vietnam-China relations. On his part, the Vietnamese president said, "We highly value projects including the cooperation in joint oil and gas exploration in the continental shelf of Vietnam." The Vietnamese president said it was important to respect the diplomatic and legal process in resolution of maritime dispute. "We reaffirm our close collaboration to support India to further its relations and multi-faceted connectivity with ASEAN attaching high importance to the maintenance of security, maritime safety and freedom of navigation and over flight, settlement of disputes by peaceful means on the basis of international law including UNCLOS (UN Convention on the Law of the Sea)," Mr Quang said. He said both sides also agreed to work closely to address regional security challenges including in the domain of maritime and cyber security. On defence cooperation, which is on an upswing, the prime minister said both sides decided to cooperate in defence production and explore opportunities in transfer of technology. The Vietnamese president said both sides continue to promote "sound cooperation" in areas, including English language teaching, capacity-building, training, concessional credit, UN peace-keeping operation, maintain effective defence security dialogues and consider expanding cooperation in other areas. PM Modi noted that defence and security cooperation is one of the strong pillars of relationship between the two countries. During the talks, PM Modi said India and Vietnam have also "agreed" to deepen trade and investment ties in sectors like oil and gas exploration, renewable energy, agriculture and textiles. The two sides also resolved to harness the potential of trade, minimise barriers and facilitate exports to bring the two way trade to USD 15 billion by 2020, which is currently around USD 10 billion. The three pacts signed after the talks between the two leaders will provide for cooperation in areas of nuclear energy, trade and agriculture. 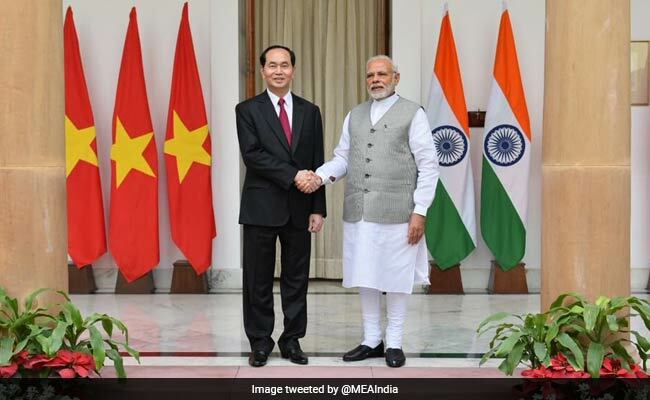 PM Modi said the two sides had extensive dialogue on all aspects of bilateral relationship and noted that Vietnam has played an important role in India's Act East policy framework and its cooperation with the ASEAN bloc. The visit of the Vietnamese president is the second high-level visit from that country in little more than a month. Vietnamese Prime Minister Nguyen Xuan Phuc was in India as one of the chief guests for the Republic Day Parade this year. "After the Vietnamese prime minister's visit in January, the visit by the Vietnamese president reflects the commitment of both the nations to further strengthen the Comprehensive Strategic Partnership between the two countries," PM Modi said. In 2016, the two countries had agreed to elevate their ties from Strategic Partnership to Comprehensive Strategic Partnership. Earlier in the day, External Affairs Minister Sushma Swaraj called on the Vietnamese president. Their discussions focused on steps to further strengthen the comprehensive strategic partnership by expanding cooperation across all sectors, Ministry of External Affairs Spokesperson Raveesh Kumar said. Mr Quang was also given a ceremonial reception at the Rashtrapati Bhavan.